Your may already be conducting online market research for your business—but you may not know it. Some of the easiest to use and most common tools are located right at your fingertips. Web searches, online questionnaires, customer feedback forms—they all help you gather information about your market, your customers, and your future business prospects. The advent of the Internet has presented small businesses with a wealth of additional resources to use in conducting free or low-cost market research. The following pages will describe the different types of tools to conduct online market research, go over the general categories of market research, and advise you how to create the best online questionnaires. You know how to do a simple Web search using search engines such as Google and Yahoo. Take that a step farther by searching for "keywords" that people would use to find your type of products or services on the Internet. See how much interest there is in these keywords -- and how many competitors you have in this market. Keyword searches can also help remind you of product niches that you might not have considered. There are other reasons to conduct keyword searches. 'First, you're going to be reminded of product niches that you might not of thought of.' says Jennifer Laycock, editor-in-chief of Search Engine Guide, an online guide to search engines, portals and directories. 'Second, these services will also give you a guesstimate of how many existing sites already use that phrase,' Laycock continues. 'How many existing sites already offer that product.' WordTracker and Trellian's Keyword Discovery are popular keyword search engines. Blogs are updated much more regularly than traditional websites and, therefore, they can be another gauge of public opinion. Search blogs by using blog-specific search engines, such as Technorati or Nielsen BuzzMetrics' Blogpulse. 'Blogs tend to move at a faster pace and be more informal in tone, so you're more likely to pick up conversation about a new product type or need on a blog than on a standard web site,' Laycock says. Another way to gauge public opinion is through online surveys. While not as scientific as in-person or phone surveys that use a random sampling of the population, online surveys are a low-cost way to do market research about whether an idea or a product will be appealing to consumers. 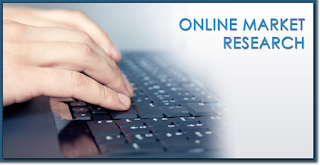 Now many companies offer to conduct online research for you or give your company the tools to carry out your own surveying. Some online survey companies include EZquestionnaire, KeySurvey, and WebSurveyor. There are a variety of types of market research tools -- both offline and online -- that are used by many large businesses and can be available to small and mid-sized businesses. When these techniques involve people, researchers use questionnaires administered in written form or person-to-person, either by personal or telephone interview, or increasingly online. Questionnaires may be closed-end or open-ended. The first type provides users choices to a question ("excellent," "good," "fair") whereas open-ended surveys solicit spontaneous reactions and capture these as given. Focus groups are a kind of opinion-solicitation but without a questionnaire; people interact with products, messages, or images and discuss them. Observers evaluate what they hear. Audience research is aimed at discovering who is listening, watching, or reading radio, TV, and print media respectively. Such studies in part profile the audience and in part determine the popularity of the medium or portions of it. Product tests, of course, directly relate to use of the product. Good examples are tasting tests used to pick the most popular flavors—and consumer tests of vehicle or device prototypes to uncover problematical features or designs. Brand research has similar profiling features ("Who uses this brand?") and also aims at identifying the reasons for brand loyalty or fickleness. Psychological profiling aims at construction profiles of customers by temperament, lifestyle, income, and other factors and tying such types to consumption patterns and media patronage. Scanner Research. Scanner research uses checkout counter scans of transactions to develop patterns for all manner of end uses, including stocking, of course. From a marketing point of view, scans can also help users track the success of coupons and to establish linkages between products. Also known as database "mining," this form of research attempts to exploit all kinds of data on hand on customers—which frequently have other revealing aspects. Purchase records, for example, can reveal the buying habits of different income groups—the income classification of accounts taking place by census tract matching. Data on average income by census tract can be obtained from the Bureau of the Census. Post-sale or Consumer Satisfaction Research. Post-consumer surveys are familiar to many consumers from telephone calls that follow having a car serviced or calling help-lines for computer- or Internet-related problems. In part such surveys are intended to determine if the customer was satisfied. In part this additional attention is intended also to build good will and word-of-mouth advertising for the service provider. Don't alienate survey takers with long questionnaires. Limit yourself to 25 questions, which should take people five to seven minutes to finish, says Mary Malaszek, owner of Market Directions, a Boston market-research firm that works with businesses of all sizes. If surveys are much longer, people will abandon them 'and then you can't use them, and the next time you send them a survey they won't even open it,' she says. Other methods for keeping surveys short, according to a SensorPro white paper on online survey guidelines: make the first page simple, present answer options in multiple columns or a drop-down box, and put a status bar at the top of each question page so respondents know how close they are to being finished. Since people want to zip through a survey, don't include a lot of open-ended questions where they have to type out the answers. Close-ended questions they can click on a button to answer—Yes, No, Maybe, Never, Often—work much better, Malaszek says. Companies can use close-ended questions to get the same kind of in-depth analysis open-ended questions provide by using rankings scales, which ask a respondent to rate something on some type of scale, 1 to 5, or 1 to 10, she says. If you're asking customers or vendors to take a survey, it's okay to send more than one invitation, especially to people who've previously indicated they would be willing to participate. Just make sure you've got people's permission, so they don't think you're spamming them, the survey experts say. Businesses decide they want to do a survey then get impatient when they can't get the results right away, Malaszek says. Even though online surveys reduce some of the work, they take time to design and administer, and when the results are in, more time to interpret. It's a good idea to pick one person to shepherd the process, she says. Brown, Damon. "Using the Web for Market Research." IncTechnology.com, October, 2006. Mariampolski, Hy. Qualitative Market Research: A Comprehensive Guide. Sage Publications, 21 August 2001. McQuarrie, Edward F. The Market Research Toolbox: A Concise Guide for Beginners. Sage Publications, 15 June 2005. Rafter, Michelle V. "Web Surveys: Taking the Pulse of Customers." IncTechnology.com. June, 2008. U.S. Small Business Administration. Small Business Planner section on market research.